Minimum deposit of $50.00 is required at opening. There is no interest earned on this account. Depositors must maintain a minimum balance of $500.00 in the account each day to avoid a monthly service charge ($5.00). This fee is waived if a compensating balance of $1,000.00 is maintained in a Statement Savings Account. Includes all the requirements and services provided to regular checking accountholders. The monthly service charge will be waived for FULL-TIME students until the age of 22. 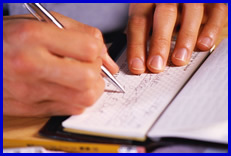 All the requirements and services provided to regular checking or club checking accountholders. The monthly service charge will be waived for accountholders age 55 and older. Existing accountholders who attain age 55 must notify Chester National Bank to qualify. Depositors must maintain a minimum balance of $1,000.00 in the account each day to avoid a monthly service charge ($8.00). This fee is waived if a compensating balance of $2,000.00 is maintained in a Statement Savings Account.